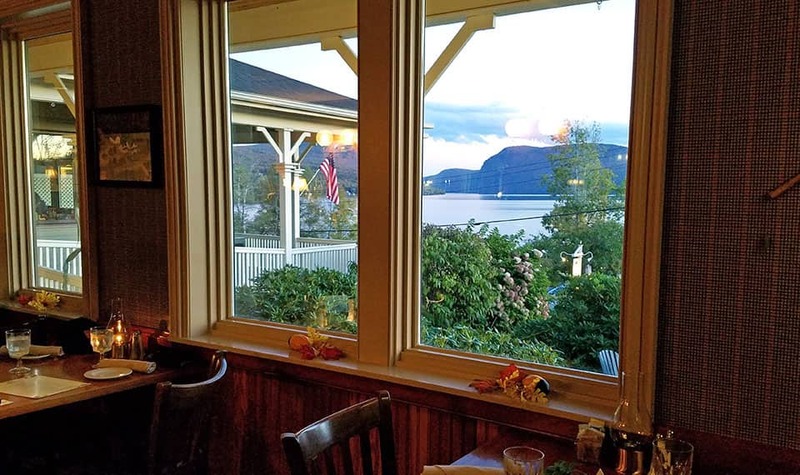 Gil’s Bar and Grill Restaurant in Westmore is the perfect place to enjoy a meal with a view. From the windows in the dining areas you look out on granite hugged depths of Willoughby Lake and the carved vistas of Mount Hor beyond. We began our meal with cocktails from the bar while enjoying the setting autumn sun reflecting from the clear surface of Willoughby. Sipping from my WilloughVale Cosmopolitan, a refreshing blend of vodka, Cointreau, cranberry and lime juice, I couldn’t help but be in awe of the show taking place outside of the windows. My husband began his meal with his traditional martini, and as the sun disappeared behind the mountains, we finally made a few selections from the menu. To start our meal we ordered the Maple Buffalo Wings and the Parmesan Zucchini Chips. I am a fan of fried squash and fried green tomatoes, so I knew these would be right up my alley. These were the highlight of the meal, as they were an unexpected delight. Beyond providing a contrast to the soft interior, the batter was delicious. The zucchini had been seasoned before being dredged allowing for layers of flavor as you bit through the crispy exterior. 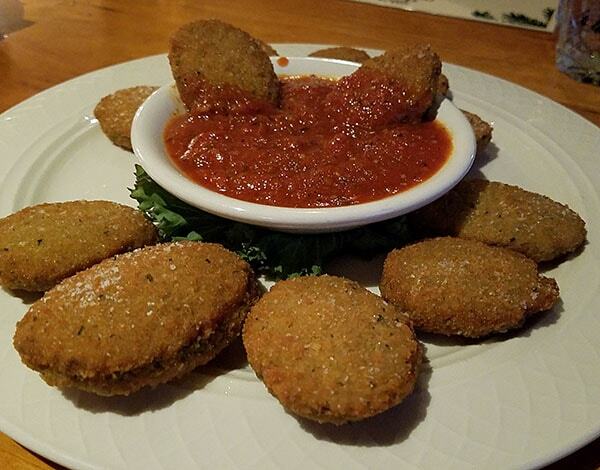 The house made marinara added more depth to the flavor profile. The wings were wonderfully crispy, but too spicy for me to eat. The thick housemade maple cayenne sauce provided plenty of kick with a sweet finish (I had to try a few bites). 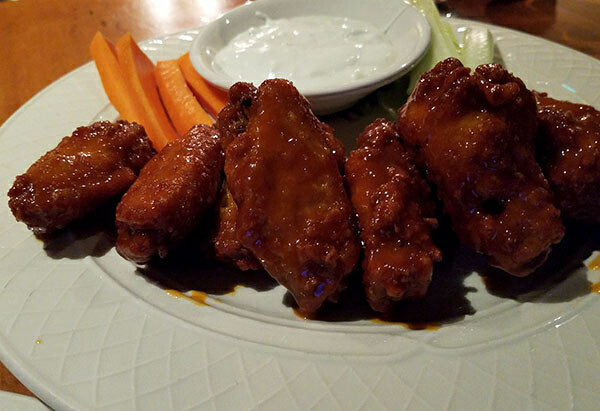 The wings were decent sized, and looked like the order was a pound of wings, as it came with 8 pieces versus the standard ½ dozen. The main meal was equally enjoyable. Though at first glance the menu seems small, there is a lot of variety on it. I ordered the Shrimp Scampi Ravioli, while my husband tried their BBQ Ribs. 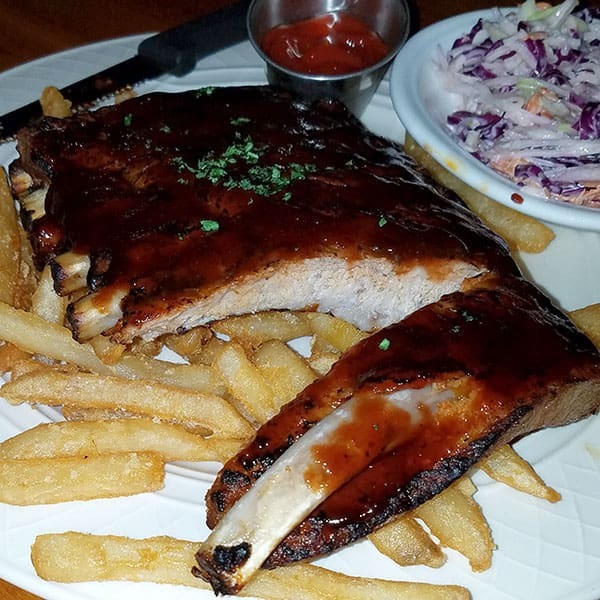 The ribs were braised and melting off the bone when they arrived at the table. The slow cooked meat had flavor all the way through. The house made bbq sauce was applied over the top, adding flavor without drowning the meat. I admit, I had to steal one from the leftovers we brought home. These were served with French fries and a well seasoned, housemade coleslaw of red and green cabbage and carrot. This was one of my favorite slaws in the area. My husband thought it needed a little horseradish. When the scampi dish arrived, I again got something a bit unexpected. 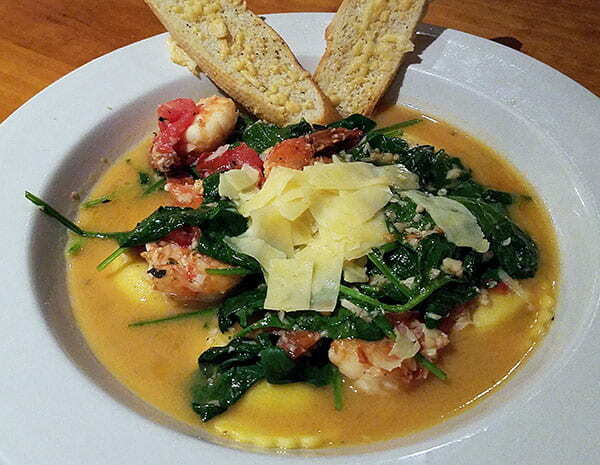 Five large seafood stuffed ravioli arrived covered in spinach, tomato, shrimp, and a scampi sauce with plenty of garlic. When I think Shrimp Scampi I picture shrimp swimming in a garlic, butter, white wine sauce. This was so much more. Gil’s Bar and Grill is a part of the WilloughVale Inn, but is open to the public for dinning. This Westmore restaurant provides a wonderful atmosphere. Though the food is high quality, and plated well, the focus is on the outside. The bar is situated to take advantage of the lake views. The interior décor is a little dark, with nautical decor. This beautifully frames the light and the picture coming from the windows. Once dark, the atmosphere resembles that of a local tavern. We enjoyed a mid autumn meal, but through the winter their hours will be a based on occupancy so call to find out if and when they will be open.